The Universe could comprise myriad dimensions, many of which may never be discovered by man. However, by the early Twenty-second Century, mankind has not only discovered nine perpendicular dimensions of the Universe, but has learned to traverse them and harness their unique properties for a variety of effects, including interspatial teleportation, temporal phasing, and time travel into parallel timelines. These nine known dimensions can be broken down into three categories: Space, Time, and Interspace, each comprising three dimensions. Most people are familiar with the three dimensions of space: x, y, and z. These represent the perpendicular dimensions of length, width, and depth. The fourth dimension, time, t, is perpendicular to the other three. The dimension of time is unique in that one can travel in only one direction through it: from past to future. The dimension of time is not a straight line, but cyclical, overlapping itself in regular loops (picture a Slinky). The bottom of this spiral would represent the past, and the top would extend into the future. From above, this spiral would appear as a circle, so dimension t could be considered the temporal circumference. Each time a new temporal cycle begins, the previous one becomes a temporal echo, or parallel timeline. There is no limit to the number of unique timelines that may exist at a given time period. The fifth dimension, r, represents the temporal radius. Picture the above-mentioned circle with circumference t. The radius, or the perpendicular line from the center intersecting with t, determines the length of the circumference. Imagine a circle with radius r and circumference t=1; this would be the standard time flow. If one travels outward through dimension r (increasing the radius) so that the circumference t=2, then one has doubled the amount of time passing in one temporal cycle, thus speeding up time to twice its normal rate. This phenomenon is known as temporal acceleration. A temporal accelerator device using this principle can be used to speed up time within an area; this can be useful in speeding up long-term experiments, such as animal breeding and genetic engineering, within an accelerated environment. 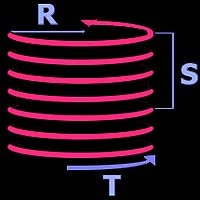 Moving inward through dimension r (decreasing the radius) would decrease the temporal circumference, t, causing a shorter amount of time to pass in a temporal cycle. This phenomenon is known as temporal stasis, or the slowing down of time. Devices using this phenomenon can be used to slow down time within a specific spherical volume, allowing objects within that area to age more slowly; this application could be used for the storage of perishable food, organic tissues, or to keep people in temporal stasis during extended space flights. Another way to understand fifth-dimensional temporal phasing is to think of time as a phonograph record, the radius of which is the fifth dimension, and the grooves of which represent the flow of time. The outside of a record traverses more distance in one revolution (temporal cycle) than the center of the record does, just as moving outward in the fifth dimension causes one to experience more time per cycle, while moving inward causes less time to pass in a temporal cycle. The sixth dimension, s, can be thought of as the distance between the temporal cycles (or the height of the above-mentioned Slinky). This dimension is used for what is known as "time travel," or moving between analogous points in parallel timelines. Copyright © Chronos Technologies, Inc. The sixth dimension has several limitations. Like time, t, dimension s is unidirectional in nature -- gateways through the sixth dimension can be opened only into the past. Also, since dimension s is perpendicular to dimension t, gateways can be opened only to the same point in different cycles -- i.e., one can travel only by multiples of whole cycles into the past. If a cycle, t, is 500 days long, then one can travel through time only by multiples of 500 days. The last three dimensions -- u, v, and w -- are the three dimensions of "interspace." 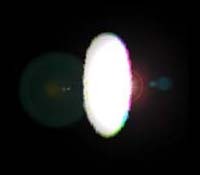 If one views the dimensions of space -- x, y, and z -- as spirals like t, then the interspace dimensions would be the distances between their respective spatial cycles, like dimension s. The travel through the interspace dimensions between two points in normal space is known as interspatial teleportation. Spatial cycles can be greatly influenced by gravitational fields. At Earth's mean surface gravity, spatial cycles are compressed to within a few meters of one another. In deep space, away from any gravitational fields, spatial cycles can be spaced to millions of kilometers apart.